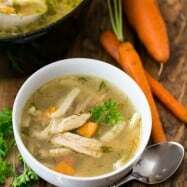 Learn how to make the healthiest, nutrient dense Chicken Stock! You can make chicken bone broth in an instant pot, slow cooker, or on the stovetop. 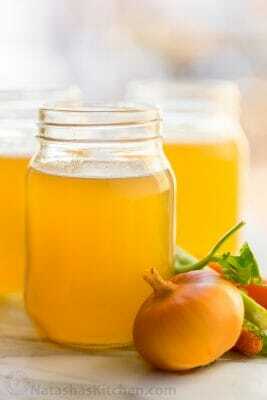 Chicken bone broth is a natural way to heal your gut and improve our health. 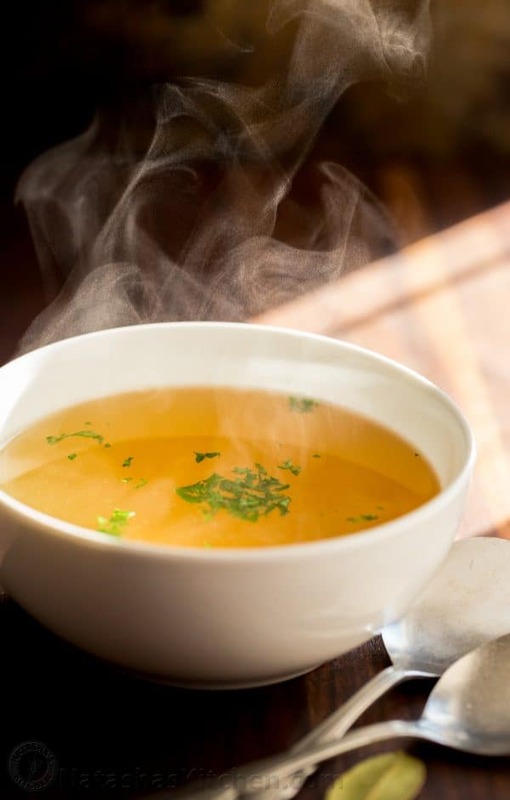 There’s a reason why people have been making chicken soup for ages when they aren’t feeling well, and if that chicken soup is a bone broth, it is truly a healing food. 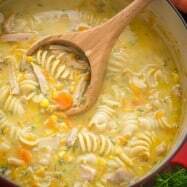 We use this chicken broth to make Easy Chicken Noodle Soup. 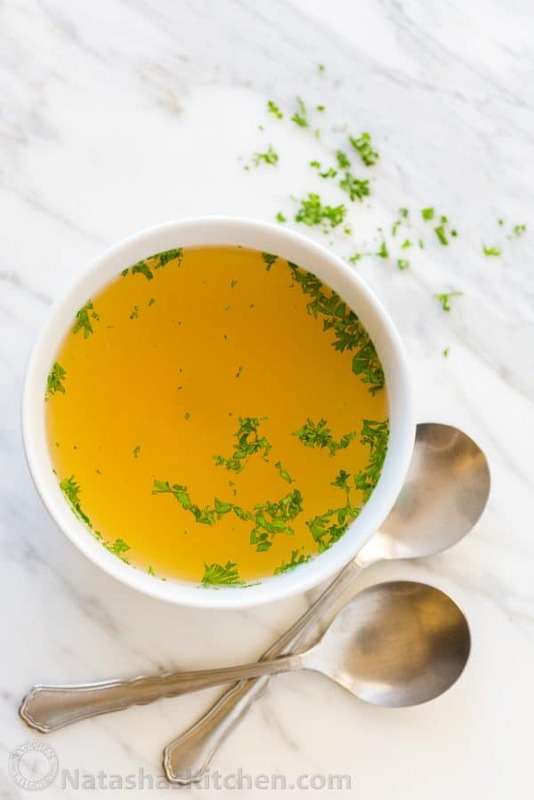 I’ve been incorporating bone broth into my diet throughout the week, using it in my cooking for recipes that call for broth or stock and the depth of flavor in bone broth just makes everything taste so much richer. I also love to ladle it into a mug, sprinkle with salt, pepper and some freshly chopped parsley and just drink it hot like tea. It makes ‘ma belly feel so good! Friends, this is our first Instant pot recipe!! To be honest, the Instant Pot (affiliate link) bone broth was my favorite method. The broth had the richest flavor and it was the clearest broth since a pressure cooker is the hands off approach. There was no skimming required, and it was the fastest method of all (2 hours of pressure cooking vs 15 hours in the crockpot or stovetop). It was amazing! I was so impressed and just completely fell in love with my Instant Pot. Note: We included Amazon affiliate links below to our favorite kitchen tools. If bones are from a cooked chicken or turkey, skip this roasting step. If using a whole raw chicken, watch this tutorial on how to cut a whole chicken. 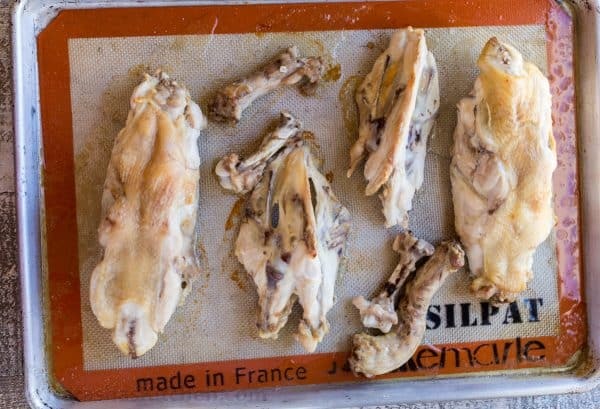 Place raw bones on a lined rimmed baking sheet and roast at 400˚F for 20 minutes. Transfer bones and any pan juices to your pot. Many recipes call for just raw bones which is ok, but roasting will really enhance their flavor. The stovetop method is best if you have a huge stock pot and want to make a double batch, otherwise, it required the most babysitting and the temptation to check on it to make sure it wasn’t boiling like crazy was definitely there! The liquid does evaporate the most which is why more water is required for this method. Pro Cooking Tip: Bone broth is best when it is cooked until you can easily break a chicken bone in half with your hands. This means the amazing nutrients from the marrow are in your broth. You also know if you cooked it long enough when it thickens after refrigeration – which is totally normal. The broth turns to liquid again when it is heated. This is the set it and forget it method! Start with warm or hot water to jump start it for heating up then set it and forget it. The slow cooker can gently simmer while you sleep. The resulting bone broth is rich in color and flavor since the broth is not stirred and never vigorously boiled in the slow cooker. This method is EASY! 1. Place roasting bones and accumulated pan juices into a 6Qt instant pot. 2. Add onion, celery, carrots, garlic, bay leaf, 1 Tbsp cider vinegar and 1 tsp salt. 3. Add 10-11 cups water or until you reach the 2/3 max fill line in the pot. 4. Select soup/broth and set the time to 2 hours (120 minutes). It will warm up then cook on high pressure for 2 hours (120 minutes). When cooking is complete, wait 30 minutes for it to naturally depressurize then release pressure (I always use an oven mitt for safety in case the valve sputters). 1. When done, strain through a fine mesh sieve into a second pot, extracting as much liquid as possible. Discard the solids. Cool strained stock to room temperature then cover and refrigerate. 2. The following day, it will thicken and you can scrape the fat off the top and continue to store in the fridge for 3-5 days or transfer to freezer safe containers and freeze up to 3 months (if freezing, leave space in containers for expansion). Filtered Water Stock Pot: 16 c., 6Qt Slow Cooker: 12 c., Instant Pot: 10-11 c.
If using bones from a cooked chicken or turkey, skip this step. Place bones on a lined rimmed baking sheet and roast at 400˚F for 20 minutes. Place roasted bones and any accumulated pan juices into your 8 qt stock pot. Add 16 cups (or 4 Qts) filtered water along with 1 Tbsp cider vinegar and 1 tsp salt. Bring to boil then reduce heat to a simmer. Skim off impurities that rise to the top. Cover and simmer on low heat 6 hrs then add onion, celery, carrots, 2 smashed garlic cloves and 1 bay leaf. Continue cooking on a low simmer another 9 hrs for a total of 15 hrs simmering time. You can turn it off overnight if needed and continue the following day. Be careful not to bring it to a hard boil or the broth will look foggy. Place roasted bones and any accumulated pan juices into 6 Qt Slow Cooker. Add 12 cups warm or hot water along with 1 Tbsp cider vinegar and 1 tsp salt. Set to low heat for 15 hrs. After 6 hours on low heat, add onion, celery, carrots, 2 smashed garlic cloves and 1 bay leaf. Continue cooking on low simmer another 9 hrs for a total of 15 hours cooking time. You can let it go longer if needed overnight and strain the next day. 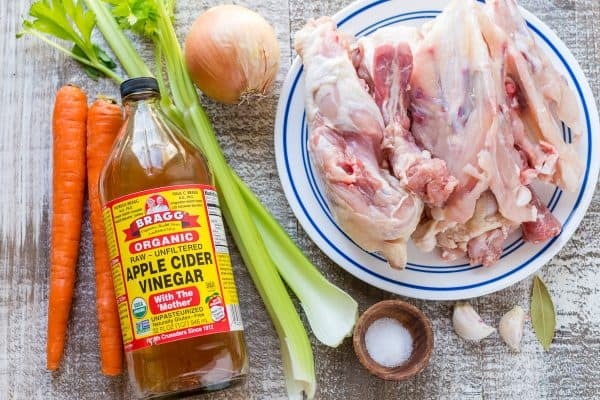 Place roasting bones and accumulated pan juices into a 6Qt instant pot. Add onion, celery, carrots, garlic, bay leaf, 1 Tbsp cider vinegar and 1 tsp salt. Add 10-11 cups water or until you reach the 2/3 max fill line in the pot. Select soup/broth and set the time to 2 hours (120 minutes). It will warm up then cook on high pressure for 2 hours (120 min). When cooking is complete, wait 30 min to naturally depressurize then release pressure (use an oven mitt for safety in case it sputters). Strain through a fine mesh sieve into a second pot, extracting as much liquid as possible. Discard solids. Cool strained stock to room temp then cover and refrigerate. The following day, it will thicken and you can scrape the fat off the top and continue to store in the fridge for 3-5 days or transfer to freezer safe containers and freeze up to 3 months (if freezing, leave space in containers for expansion). 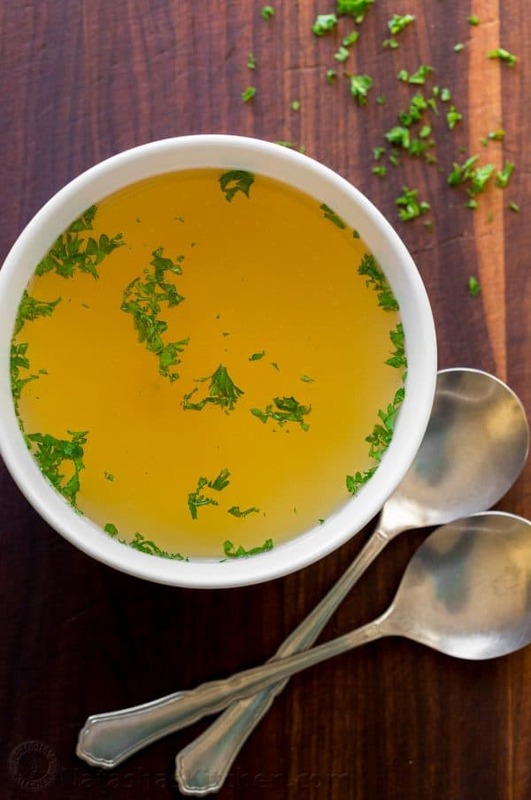 Enjoy this in any of your favorite recipes that call for broth or chicken stock. 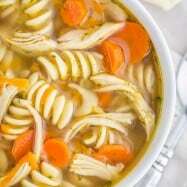 I find myself craving this simple and flavorful chicken stock served just like this. I hope you love it as much as we do! P.S. Our next post will be related to this one and will be a fun one with a real live chicken! Stay tuned for Friday’s video!! Oh and PPS. If you do buy an instant pot, you’ll be so glad you did. I am completely smitten with it and I see why it has all the incredible reviews on Amazon. I have an instant pot recipe coming that will get you all kinds of excited!! 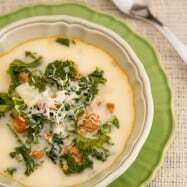 Have you been experimenting with your instant pot? I’d love to hear about your ideas and recipes below! Hi Natasha, can I use 2.5 lbs of chicken drumsticks? They are raw. Amazing! We can’t buy instant pots within New Zealand but I got something similar just this month and I’m so happy with this recipe! 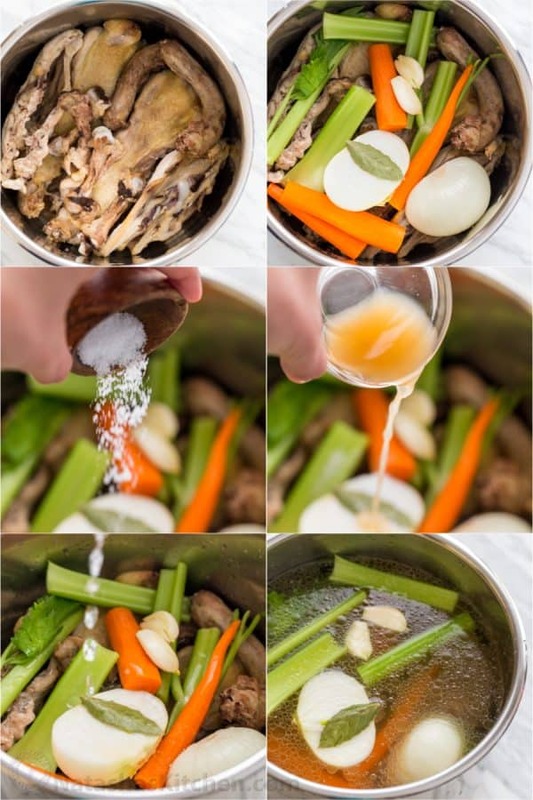 It makes such a quick flavourful clear stock without all the skimming. This recipe turned out amazing!! I didn’t peel any of my vegetables, leaving the paper on the onion, so mine turned out much darker than yours, plus, I added a generous handful of dried shiitake mushrooms for more flavor. I also used the bones from 2 store bought rotisserie chickens. So excited you got the pot! Looking forward to the recipes! I make chicken (and beef) broth the same way as you do, keeping aromatics and sodium at minimal. I prefer the stovetop method, barely simmering it for several hours. I also peel off the skin and remove any visual fat before roasting the pieces. What i wanted to share is my storing method. I sterilize quart sized (sometimes even half-gallon) jars, lids and mouth rings and after the broth is done i skim off any excess fat, and filter the broth of any impurities through fine mesh strainer and tighten up the lids. They seal properly, as when you’re canning. So this method keeps the broth in the fridge at least for two weeks (usually i use it earlier) without changing the taste and flavor. The key is to sterilize jars and lids and also that broth needs to be boiling-hot temperature. Making bone broth in the IP has been my favorite method since I got my appliance. I make it pretty much the same but I do omit the carrots since carrots give the broth a sweetness which I’m not fond of. But we all have our preferences! 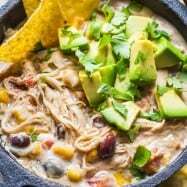 I have to try this instant pot method, I got excited when I seen that u have that method. I love my instant pot so I’m definitely looking forward to more recipes that u will come up with so I can use it even more😄 Thank you once again!